Home » Blog » Awning Parts & Supplies: Call Paul for Awning Repairs! An awning offers reliable and convenient coverage come rain or shine. But frames rust, levers crack, and fabrics can tear over time. Even the most durable awning can be ripped apart by a vicious storm or violent downpour. At Paul Construction and Awning, we have access to a wide variety of awning parts and supplies, giving us the tools to restore your shade solution back to its original luster. For more than 25 years, Paul Construction has helped homeowners discover the full potential of their properties by building enduring structures that are both stylish and functional. Our awning specialists are ready to breathe new life back into your old awnings; just call 610-287-1623 and ask for Paul to get started. If your awning has fallen victim to age or wear and tear, it pays to call in a specialist to find the right solution. With our industry connections, the pros at Paul Construction and Awning will never struggle to find the right awning parts and supplies to repair your shade solution. As a result, you can rest assured that there is no issue too complex for our pros to solve. In some cases, it may be necessary to replace your awning. The Sunesta retractable awnings we carry and install are some of the best available, providing reliable coverage backed by an extended warranty. Sunesta’s awnings come in a wide variety of sizes, styles, and colors, letting us tailor your new shade solution to your exact tastes. These awnings can also be upgraded with advanced features such as motorization. 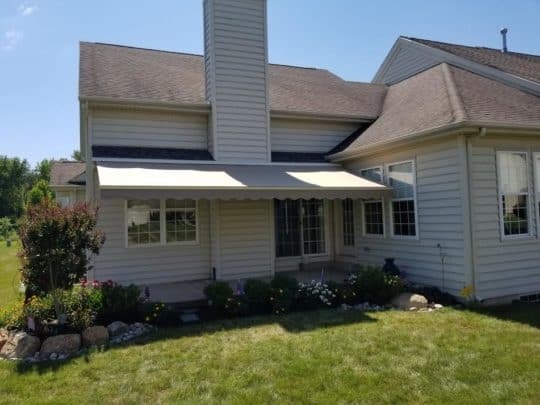 The pros at Paul Construction will work fast to ensure your new awning will be set up and ready to use within 3 weeks after you have placed your order. For awning repair, installation, re-patching, and more, you can trust the pros at Paul Construction to do the job right the first time and reinvigorate your outdoor space. Besides our awning repair services, we also build basement additions, patios, decks, sunrooms, gazebos, trellises, and more. To get a quote, call 610-287-1623 today.